Phoenix, AZ – November 30, 2017 – ABI Multifamily, the Western US's leading multifamily brokerage and advisory services firm, is pleased to announce the $59,000,000 / $256,522 Per Unit sale of the Alta Fillmore Apartments located in Phoenix, Arizona. 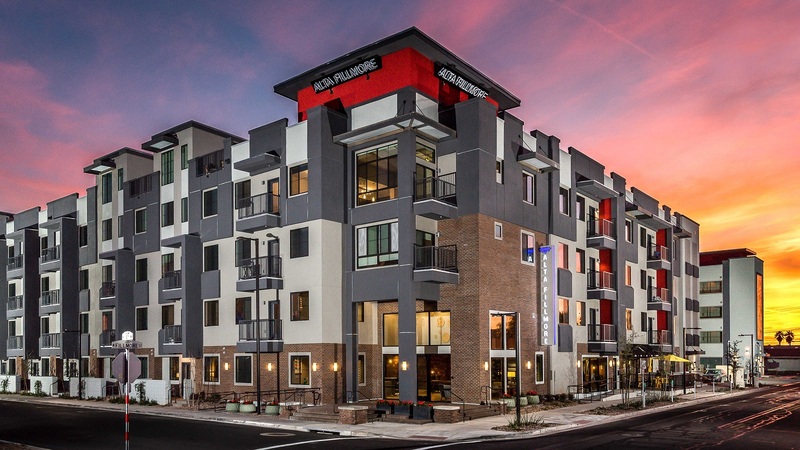 Developed by Wood Partners, Alta Fillmore is a five story, midrise-style apartment community located in Downtown Phoenix and rests on approximately 4.01 acres. The property was built in 2016 of frame construction with flat roofs and individually metered for electricity. The property boasts an attractive unit mix of 141 - 1 bedroom, 84 - 2 bedroom and 5 – 3 bedroom unit types with a weighted average size of 934 square feet. "Alta Fillmore offered the buyer, Canada-based Pure Multi-Family REIT, a number of strategic advantages," states Rue Bax, Senior Managing Partner, lead broker for this transaction who represented both the Buyer and Seller. "First, Pure Multi-Family was seeking an Institutional Grade, Class A property in the US Sunbelt (Arizona and Texas). Second, the Buyer sees Downtown Phoenix as a strong performing submarket, within the Greater Phoenix area as a whole, especially in light of the significant population and job growth the area has witnessed since 2010. The property is located a few blocks west of Downtown Phoenix's jobs corridor along Central Avenue, connected via Light Rail, and ASU's downtown campus. Since 2013, the area has witnessed thousands of new job announcements, the most recent of which Quicken Loans announced it would be moving 1,100+ employees to the One North Central Building." Downtown Phoenix boasts the highest concentrations of employment in Arizona, in fact, over the past decade the area has witnessed over $4.7 billion of both private and public investment led by the $1.7 billion Metro Light Rail system with Downtown serving as its central hub. Other major economic drivers include: ASU Downtown Phoenix campus which is now home to more than 12,000 students and the Phoenix Biomedical Campus (PBC), a 30-acre urban research park in the heart of downtown with an annual economic impact of more than $1.3 billion. The Buyer, Pure Multi-Family, is a Canadian based, publically traded REIT. The Seller, Wood Partners, is a private investment/development company based in Georgia. The multifamily brokerage team of Rue Bax, John Kobierowski, Alon Shnitzer, Eddie Chang and Doug Lazovick, represented both the Buyer and Seller in this transation.